The Stradivari family must be rolling over in their 300 year old graves. These artisans devoted their lives to producing the legendary Stradivarius violins, whose sound, according to reputation, has defied attempts to explain or reproduce. While we cannot yet duplicate the exact sound, the violin itself can be reproduced with the press of a print button — by a 3D printer. And if you want more than one copy, just bump up the number of copies. How about a dozen Strats for little Johnny’s high school music class? To be fair, the replica was not entirely 3D printed. 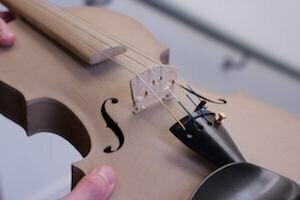 An EOS Laser-Sintering 3D printer printed the body, and professional a violinmaker — a luthier — assembled it along with the traditionally made fine tuner, pegbox and strings. We’re not at the point yet where a 3D printer can create the violin out of wood. For now, we have to be satisfied with a high-performance industrial polymer. How does it sound? Someone in the UK Wired office attempted what they call a “questionable rendition of British hard rock band Deep Purple’s Smoke On The Water. Unfortunately, there is no public taping of that that we can hear. But, we do hear it plays beautifully. In fact, you can hear it played in this short performance of ‘In the Meadow’ by an unnamed violinist. About Eos: The german-based company claims to be the world leader in laser sintering, which is a an additive layer manufacturing technology which enables the fast, flexible and cost-effective production of products, patterns or tools directly from electronic data. They sell systems in 32 countries.